Perfume is one of my favourite beauty products, and I have a pretty huge collection of different fragrances which I love to change up every single day depending on my mood. 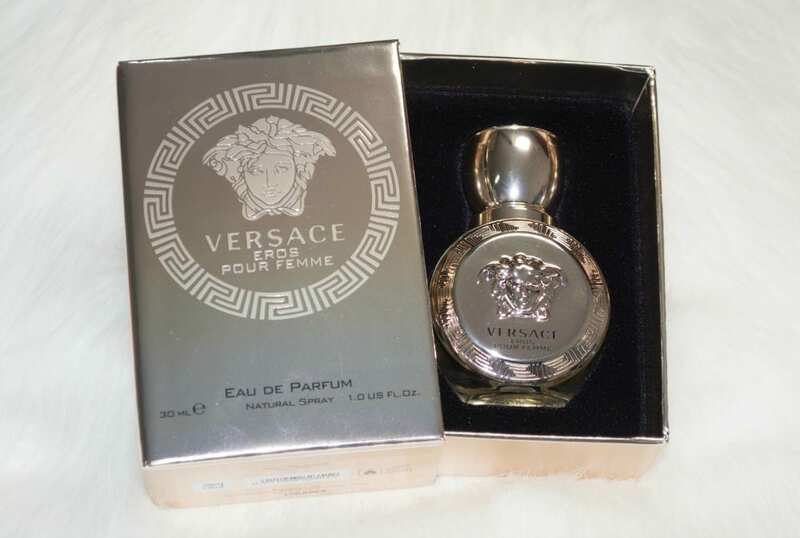 Sometimes, you smell a fragrance for the first time and it instantly wows you and that’s exactly what the brand new Versace Eros Pour Femme Eau de Parfum 30ml £50* did, the very first time I spritzed it. I wasn’t entirely sure I’d like the new Eros Pour Femme as I’m not a fan of the mens Eros fragrance as it’s a little mature for my liking, but I absolutely love Eros Pour Femme; I just can’t get enough of it, so I urge you to give it a try next time you’re passing an House of Fraser store, as it launched yesterday. I’d describe Eros Pour Femme as being what I’d call a statement scent.. it’s the type of scent that has impressive silage so people around you can smell it on you, but it’s not too overpowering at all. 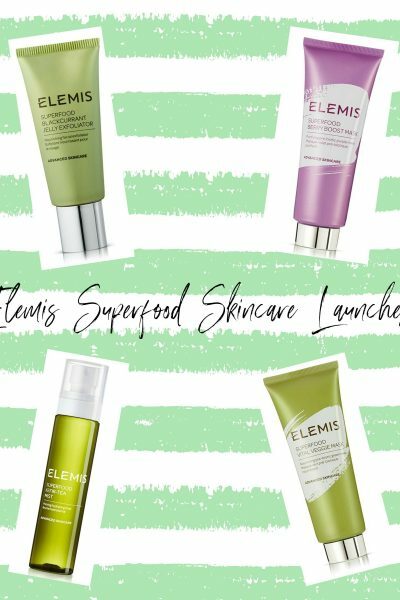 It has amazing longevity, and lasts for around seven hours on my skin and I only need one spritz as it’s such a good quality fragrance. Eros Pour Femme opens with top notes of; sicilian lemon, calabrian bergamot and pomegranate, a heart of lemon, sambac jasmine absolute and peony with a base of sandalwood, ambroxan and musk. If I’m honest, the list of notes isn’t particularly appealing so you mustn’t let them put you off as this is truly a stunning scent. The presentation of Eros Pour Femme is equally as beautiful as the fragrance itself, with a glossy, gold box with a drawer that pulls out to reveal the golden bottle nestled within its velvet lining. 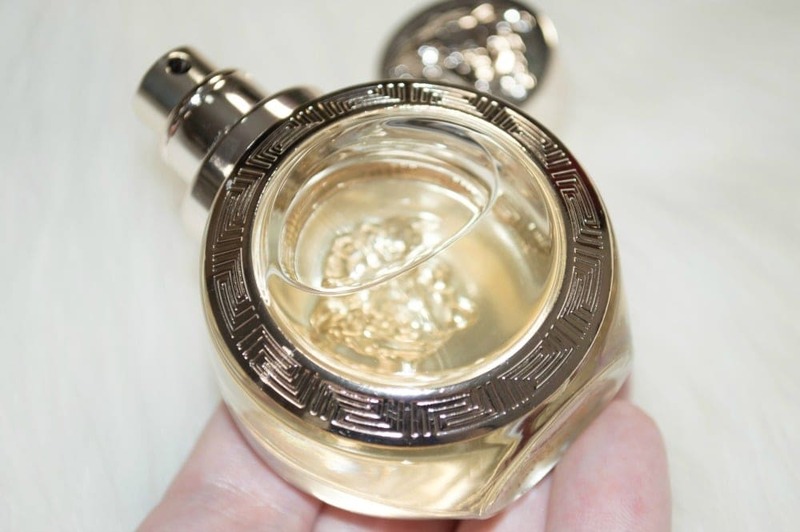 The bottle and lid are both incredibly weighty, and the bottle has been designed to resemble a Greek coin with the iconic Greek ‘key’ design featuring on both the front and back and Eros; the Greek god of love features on the front of the bottle. 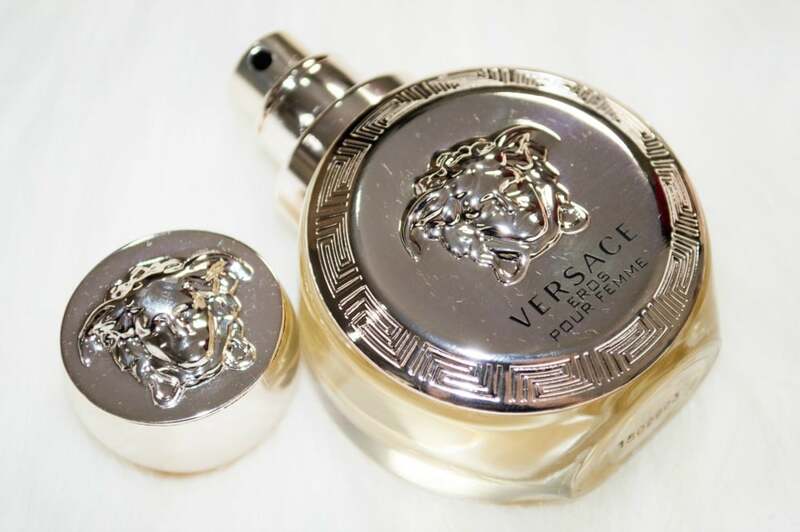 I’ve fallen head over heels in love with Versace Eros Pour Femme, and I’m delighted that I’ve been very kindly gifted a second bottle to giveaway here on my blog to one lucky reader so make sure you read the terms and conditions below and enter via the Rafflecopter. – There will be one winner chosen at random by the Rafflecopter form. – The winner be notified by the email address given and will have 48 hours to respond. If the winner doesn’t respond within 48 hours, an alternative winner will be selected via Rafflecopter’s randomiser. 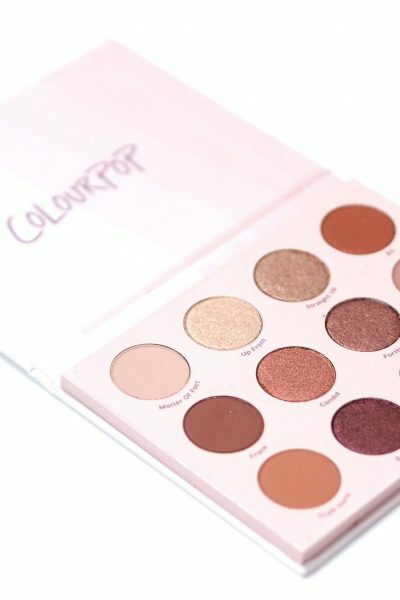 – Due to the Royal Mail’s postage rules, this giveaway is open to UK residents only. – One lucky winner will win a 30ml bottle of the Versace Eros Pour Femme Eau de Parfum worth £50. There is no cash alternative. The prize has been generously gifted by House of Fraser, and I will send the prize to the winner myself via recorded delivery. – There is no purchase necessary to enter this competition. – All entries will be moderated with any incomplete, false or duplicate entries being removed from the giveaway entirely.